The faithful who devoutly assist at the public novena in honor of the Holy Ghost immediately preceding the feast of Pentecost may gain an INDULGENCE OF 10 YEARS ON ANY DAY OF THE NOVENA, AND A PLENARY INDULGENCE, if they take part in at least five of the exercises; and moreover go to confession, and receive Holy Communion and pray for the Holy Father’s intentions. 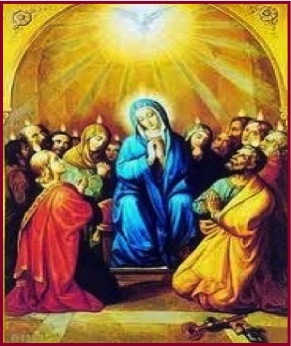 Those who make a private novena in honor of the Holy Ghost, either before Pentecost or at any other time in the year may gain an INDULGENCE of 7 years on any day of this novena, and a PLENARY INDULGENCE under the usual conditions; but if a public novena is held, this indulgence is available only to those who are lawfully hindered from being part in the same. O Lord Jesus Christ, Who before ascending into heaven, did promise to send the Holy Spirit to finish Your work in the souls of Your Apostles and Disciples, deign to grant the same Holy Spirit to me that He may perfect in my soul the work of Your grace and Your love. Grant me the Spirit of Wisdom that I may despise the perishable things of this world and aspire only after the things that are eternal, the Spirit of Understanding to enlighten my mind with the light of Your divine truth, the Spirit of Counsel that I may ever choose the surest way of pleasing God and gaining heaven, the Spirit of Fortitude that I may bear my cross with You and that I may overcome with courage all the obstacles that oppose my salvation, the Spirit of Knowledge that I may know God and know myself and grow perfect in the science of the Saints, the Spirit of Piety that I may find the service of God sweet and amiable, the Spirit of Fear that I may be filled with a loving reverence towards God and may dread in any way to displease Him. Mark me, dear Lord, with the sign of Your true disciples and animate me in all things with your Spirit. Amen. Holy Spirit! Lord of light! From Thy clear celestial height, Thy pure beaming radiance give! Only one thing is important—eternal salvation. Only one thing, therefore, is to be feared—sin. Sin is the result of ignorance, weakness, and indifference. The Holy Ghost is the Spirit of Light, of Strength, and of Love. With His sevenfold gifts, He enlightens the mind, strengthens the will, and inflames the heart with love of God. To ensure our salvation, we ought to invoke the Divine Spirit daily, for “The Spirit helpeth our infirmity. We know not what we should pray for as we ought. But the Spirit Himself asketh for us. Almighty and eternal God, Who has vouchsafed to regenerate us by water and the Holy Ghost, and hast given us forgiveness of all our sins, vouchsafe to send forth from heaven upon us Thy sevenfold Spirit, the Spirit of Wisdom and Understanding, the Spirit of Counsel and Fortitude, the Spirit of Knowledge and Piety, and fill us with the Spirit of Holy Fear. Amen. Come, Thou Father of the poor! Come, with treasures which endure! Thou in toil art comfort sweet, pleasant coolness in the heat; solace in the midst of woe. adversity, sustain my efforts after holiness, strengthen my weakness, give me courage against all the assaults of my enemies, that I may never be overcome and separated from Thee, my God and greatest Good. Amen. Light immortal! Light Divine! Visit Thou these hearts of Thine, and our inmost being fill. Come, O Spirit of Understanding, and enlighten our minds, that we may know and believe all the mysteries of salvation; and may merit at last to see the eternal light; and in the light of glory to have a clear vision of Thee and the Father and the Son. Amen. uide the steps that go astray! give them life with Thee on high give them joy which never ends. Amen. This Novena is the oldest novena, first made at the direction of Our Lord when He sent His apostles back to Jerusalem to await the coming of the Holy Ghost on the First Pentecost. It is the only novena officially prescribed by the Church. Addressed to the Third Person of the Blessed Trinity, it is a powerful plea for the light, strength and love so sorely needed by every Christian. To encourage devotion to the Holy Ghost, the Church has enriched this novena with indulgences.